The Canadian Wood Fibre Centre (CWFC) recently demonstrated the use of the Bio-Harvester for the first time in Canada. The European purpose-built, front mounted chipper on a 400 horsepower, RT400 Fecon tracked mulcher is able to harvest, chip and collect woody biomass into a trailer being pulled by the mulcher. CWFC’s interest in demonstrating the technology is to demonstrate options to harvest and capture biomass on short rotation woody crop (SRWC) plantations and natural stands. As an alternative to mulching, the biomass can be recovered using the Bio-Harvester to generate income and potentially reduce the cost of managing that biomass. It can be used to create biomass from both hardwood and softwood fibre. As part of the demonstration, Keddy rented a high dump trailer commonly used in the agriculture industry, which was towed behind the mulcher and used to collect the biomass as it was being chipped. It is capable of lifting and dumping its load into a truck for transport. The front mounted chipper was designed specifically for biomass recovery and is manufactured by a German company, AWRI, and brought to North America by Fecon Inc. for demonstration. It is able to harvest trees up to 13 centimetres in diameter. During the demonstration, the system harvested 0.6 hectares per hour. Harvesting is typically done in late fall to winter to collect the woody biomass without the leaf litter. The head is adjustable so that stumps can be cut very close to the ground. Keddy says there are a number of potential uses for this technology. The first potential use is for harvesting SRWC plantations of densely planted willow and hybrid poplar. The SRWC can be harvested every three years, with up to seven coppice cycles per root system. The second is on natural stands. With its versatility, companies could comfortably establish a combination of short rotation woody biomass plantations in close proximity to their facilities to complement the woody biomass they acquire from natural stands, knowing that they can use the same system to harvest both. A third potential application for this technology is by other industries, such as oil and gas and hydro—essentially any environment where trees up to 13 centimetres in diameter are being removed. Rather than the woody fibre being mulched and left on site, this technology allows for collection of the biomass and removal from the site. A fourth potential use is an option for the Fire Smart program, to remove fuel sources particularly around communities to protect them from forest fire hazards. An advantage of using this technology is that the biomass is removed from the site and not left on the ground as potential fuel. Keddy adds that by combining the Bio-Harvester with a soil stabilizing head that can actually dig 12 to18 inches into the ground, stumps and roots can be removed, allowing for the site to be disced and seeded the following spring. CWFC is also investigating its performance. So far, CWFC has demonstrated this front mounted chipping and biomass recovery technology on a plantation. Now, it will demonstrate and investigate its use harvesting small diameter natural stands of willow, black spruce and tamarack, and a mature forest featuring aspen with a variety of understory vegetation for the Fire Smart program. CWFC’s interest in highlighting the Bio-Harvester is to demonstrate options to harvest and capture biomass on short rotation woody crop plantations and natural stands. The Bio-Harvester could generate income and potentially reduce the cost of managing biomass. For more information on this technology and demonstration findings, contact Tim Keddy at (780) 435-7212 or tkeddy@NRCan.gc.ca. A woodlot is a natural source of firewood. Recovering this energy source is an easy way for landowners to regularly profit from their woodlot as it matures, either by marketing this product or using it as an alternate energy source within their own buildings. Regular culling of distressed trees from a woodlot for firewood also reduces the fire and insect infestation risk, and results in a healthier forest with genetically stronger, higher value trees that can bring more income once they reach maturity. Furthermore, landowners can combine harvesting firewood and creating trails within their woodlots to create easier access to the remaining wood for harvesting and for recreational use of the property. Toso Bozic, Bioenergy Specialist and Agroforester with Alberta Agriculture and Rural Development, who also has extensive experience with how woodlots are managed in Europe, says that there is a growing market for firewood, particularly among acreage owners. However, the difference between a successful and struggling firewood business often comes down to marketing. He says that firewood businesses need to find ways to differentiate themselves from their competitors, and suggests that guaranteeing quality and providing good service are two important goals to consider. For example, a firewood company may want to take the time to measure the moisture content in the firewood they are marketing to guarantee to potential customers that the product is optimum fuel quality. Also, businesses may want to consider how they package their product and whether or not they will offer delivery. 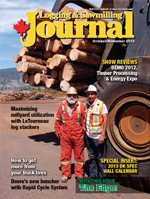 Surveying high traffic businesses such as convenience stores, hardware stores, and grocery stores as well as local farmers, acreage owners, and camp sites to determine demand within reasonable proximity to the business are also important activities for building a business case for establishing a firewood business. In terms of species, Bozic, who is a forest engineer, says the species of firewood offered for sale is not so important as the moisture content in the wood that is being sold. While species like birch do naturally burn hotter because it is a denser hardwood, as long as the wood species being marketed has a moisture content around 20 per cent, it should burn well and safely. He says it is excessive moisture content that contributes to less than optimum burning and problems with creosote build-up in chimneys. Landowners should note that the drying time interval is different for each species. “A pound of wood will produce the same amount of heat no matter what species it is,” says Bozic. “A cubic foot of air-dried white birch weighs about 16 kilograms, while a cubic foot of white spruce weighs about 11 kilograms. A larger volume of spruce is required to get the same weight and the same heating value as birch.” There is no denying that birch is a preferred species among acreage owners, and from a marketing perspective it is wise to pursue an existing demand. Producing firewood is still hard work but technology has advanced significantly. While most landowners will typically use a chainsaw to fall and buck standing timber, today they can use existing equipment such as tractors and all-terrain vehicles to retrieve and load logs. 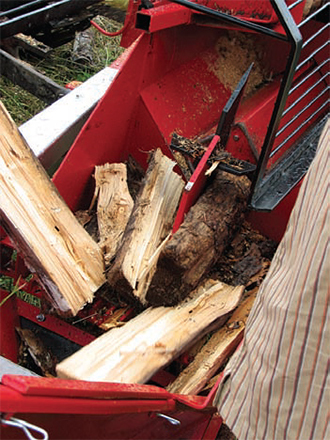 There are also a wide variety of mechanized and automated log splitters commercially available. “There is a lot less labour involved—it is much more mechanized, and you are able to achieve much higher production,” says Bozic. Besides sourcing wood from individual private woodlots, landowners can also obtain an annual harvesting permit from Alberta Environment and Sustainable Resource Development to harvest up to five tonnes of firewood. Over 7,000 permits were issued by this department in 2011. Other potential sources for firewood are industries such as oil and gas and forestry. Sawmills will often have reject material available at minimal cost that can be sawn into pieces, packaged, and sold for a good return on investment. Logging contractors create high volumes of slash from their logging activities and the tops of trees typically 4” and less are left in the cut block, piled and burned, when it could be packaged and sold as firewood. Black spruce is one of the most important boreal tree species in Canada. However, little information is available on its machining properties. Previous research revealed that compared with other wood species, it is difficult to produce defect-free surfaces when planing black spruce. Numerous knots and grain deviation result in torn grain, whereas differences in density among early- and latewood cause raised grain. This work evaluated the effect of four surfacing processes on the surface quality and poly (vinyl acetate) (PVA) gluing performance of black spruce wood samples. Different surface roughness parameters were evaluated to predict the long-term loss in adhesion of glued members. For each machining process, surface quality was evaluated by assessing level of cellular damage and glue penetration through microscope observations. Samples were virtually free of cell damage. Cutting took place in or close to the middle lamella. Thus, few tracheid lumens were exposed and, as a result, the glueline was thin (~65 ƒÊm). Specimens were characterized by sound areas, similar to that of oblique-cut surfaces as well as superficial subsurface damage that occasionally extended down into the first two layers of cells. During cutting, more lumens were exposed and, for this reason, glue penetration was increased. Level of fibrillation also contributed to increased glue line thickness (~81 ƒÊm). Samples showed slight cell deformation along the cutting direction of knives for early wood. In latewood, cell damage was characterized by micro-ruptures in the middle lamella. Adhesive filled up to the first three to four cell layers in early wood, while penetration was poor in latewood due to reduced exposure of lumens. Mean glueline thickness (including filled lumens) was ~87 ƒÊm. This indicates that when using conventional planing and face milling, the amount of open lumens and micro-ruptures appears to facilitate PVA glue penetration. Among the four machining processes, sanding produced the most cell damage. Ruptures and cell deformation affected the first three layers of cells in early wood (~100 ƒÊm). Late wood cells were also damaged but to a lesser degree. In the sanded samples, deeper ruptures were present in the rays and the middle lamella of tracheids. Gluelines of sanded samples were significantly thicker than for the other machined samples (~110 ƒÊm). As sanded surfaces did not show open tracheid lumens, adhesive remained in the first layer of cells. In contrast to the planed samples, subsurface damage in sanded samples did not facilitate adhesive penetration. Means of glueline shear strength were statistically similar for the four machining treatments before the specimens were submitted to the aging treatments. After aging, shear strength of oblique-cut specimens decreased by 38% and was significantly lower than that of face-milled specimens. Samples prepared by face milling, peripheral planing, and sanding were characterized by the presence of micro-ruptures that acted as discontinuities during the swelling-shrinkage cycles of cell walls during aging. Adhesive penetration and the level of fibrillation also influenced the impact of the weathering treatment on face-milled samples (23% loss in adhesion). These samples showed the deepest adhesive penetration as well as important fibrillation. Levels of adhesive penetration and fibrillation both increased the contact surface between adhesive and cell walls, thus enhancing mechanical anchorage and resulting adhesion. Although adhesive penetration and fibrillation were lower for peripheral-planed and sanded samples than for face-milled samples, loss in adhesion during weathering was slightly higher (31 and 27%, respectively). In contrast, oblique-cut specimens were characterized by the absence of microruptures, low adhesive penetration, as well as little fibrillation. The low mechanical anchorage of adhesive on oblique-cut surfaces combined with the natural shrinkages welling movements of cell walls had a greater impact on shear strength during weathering (38% loss in adhesion) compared with other treatments. The analysis showed that all four machining treatments yielded quite similar results in terms of gluing performance before weathering, indicating that black spruce wood was easily glued with PVA. The quality of all surfaces was satisfactory, and the microscopic and topographic differences observed among the machining treatments were not sufficient to generate significant differences in terms of glueline shear strength. Glue penetration was favoured by the number of open lumens and rays but limited by the level of subsurface damage. Level of fibrillation reduced adhesive squeeze-out while increasing the actual surface available for mechanical anchorage. Although weathering had a significant negative effect on glued samples, shear strength and percentage wood failure were statistically similar regardless of surfacing treatment. Peripheral-planed and face-milled samples were characterized by slight fibrillation and micro-ruptures that promoted glue penetration and anchorage while lowering squeeze-out. Both machining processes would be good alternatives when considering productivity. 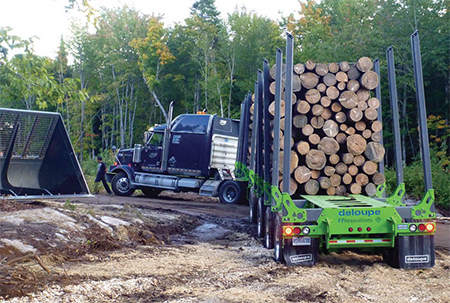 FPInnovations was front and centre with cutting-edge technologies and practical research program-based solutions at the DEMO International 2012 forest equipment show, held in September in Saint-Raymond, Quebec. FPInnovations researchers were among the many that used the event to broaden their network of contacts within industry as well as brainstorm with colleagues regarding new applications and products. Extension specialist Guyta Mercier, who coordinated FPInnovations’ forestry value chain display and demonstrations, said she was delighted with the reaction of those who came to visit; they seemed genuinely interested and eager to learn more. “From precision forestry and road evaluation services to wood products and biomaterials, visitors to the FPInnovations exhibit were treated to the extensive line of solutions provided by FPInnovations’ research teams,” she said. Technologies featured at the show included ground-based LiDAR, a forestry application that goes beyond recording diameter and basal area measurements. LiDAR can provide three-dimensional images of trees that include details such as the tree’s tapering, branching and canopy characteristics. Integrated with FPOptitek software, LiDAR data can give information on what wood products can be produced from standing trees. FPDat was another FPInnovations technology featured. It is a computer designed to collect and analyze data on the performance and productivity of forest machinery. It allows information exchange between various machines and provides real-time knowledge of roadside stand volumes harvested. For those looking to find ways to protect residual biomass, FPInnovations had the answer with their special cover distributed by Vancouver-based InterWrap on display. The cover is said to help maintain the moisture level achieved after the biomass dries during the summer. In the research area of biomaterials, FPInnovations showcased innovative composite boards, wood fibre insulating products, nanocrystalline cellulose-based products and cellulosic gel bags. Biofuel enthusiasts were shown a demonstration of the manufacturing of biofuel and its derivatives. And those looking to find next generation papers were shown eco-friendly packaging that resists water, oil and grease, biodegradable and ultra-absorbent sanitary tissue and absorbent fluff pulp. Value-added finishing products were part of the FPInnovations exhibit as well. Presenters demonstrated nanocrystalline cellulose-based varnishes that make surfaces more resistant to scratches as well as offer striking color effects. FPInnovations’ semi-trailer, made with composite materials, was also on location. This unit uses stakes and bunks made out of ultra-light composite materials. Produced exclusively by Deloupe Inc., a company based in the Beauce region in Quebec, this semi-trailer offers an overall reduction in weight that makes it possible to transport more wood as well as saving on fuel for empty return trips. For more information on FPInnovations’ participation at DEMO International 2012, please contact Guyta Mercier a guyta.mercier@fpinnovations.ca or at 418-648-5828. The University of British Columbia is the first Canadian university to produce clean heat and electricity from biofuel. And FPInnovations helped make that happen. The biomass-fueled system creates synthesis (syn) gas that is then burned in raw form to produce steam or is conditioned to create ultra clean syn gas that is injected into an internal combustion engine used to generate electricity. 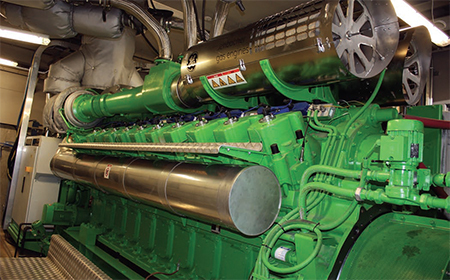 The system provides heat and power to the University of British Columbia’s Vancouver campus. Housed on the campus itself, the Bioenergy Research and Demonstration Facility (BRDF) officially opened to invited guests including; the B.C. Minister of Advanced Education, Innovation and Technology and Minister Responsible for Multiculturalism John Yap; Wai Young, Member of Parliament for Vancouver South; and retired FPInnovations Executive Vice-President Jim Dangerfield who remembers when the project was just getting started. In addition to the fact that the $34 million facility is the only one of its kind in the world, the walls of the structure it is housed in consists of Cross-Laminated Timber, a laminated lumber product that is well known in Europe but just now being introduced into Canada. Since the facility’s completed construction phase of approximately two years, CLT is now produced in B.C. on a commercial scale and plans are to expand the production site where it is currently made. Described as “a living laboratory on campus”, the BRDF is open to those interested in learning more about the bio-energy model that its creators describe as having the potential to be “replicable and relevant in other communities”. UBC Professor and Vice-Chancellor Stephen Toope said the university wants to continue to be a leader in sustainability efforts which is why a goal has been set to become 100 per cent sustainable in the future. The facility already puts them part of the way there as it reduces UBC’s greenhouse gas emissions by 5,000 tonnes annually, which equates to a 10 per cent clean energy production count of the campus’ heat and power. By the year 2015, UBC says it is committed to reducing its greenhouse gas emissions by 33 per cent. 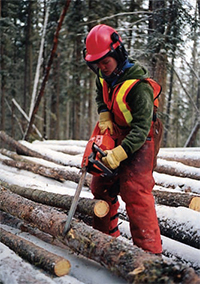 The Canadian forest sector is undergoing many transformations in its quest to be globally competitive. One transformation on the horizon is the switch from natural origin stands to second growth stands that were planted. Natural stands generally start with a surplus of seedlings and competition sorts it out to fewer stems/ha by harvest time. In plantations, we generally start with fewer stems/ha and tend these stems to keep them growing until harvest time. This density difference can affect the external and internal wood characteristics. Planners, harvesters, and mill managers need to know these differences so they can reduce costs and optimize products to squeeze more value from these future forests. 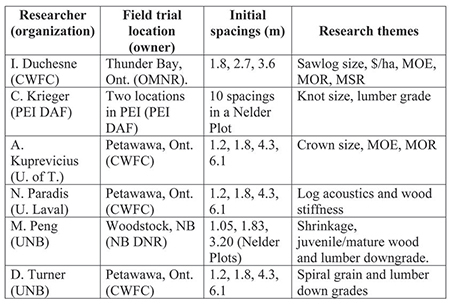 In this article, we look at some ongoing research that relates initial planting density to wood quality in white spruce. To study wood quality characteristics resulting from initial planting density, we have to find stands planted at different densities long enough ago to have grown to sawlog size. Fortunately the Growth and Yield (G&Y) people established, maintained, and measured numerous field trials (also known as Spacing Trials, Nelder Plots) to feed data into growth models. Unfortunately, for wood quality, we need to destructively sample trees which can compromise the G&Y aspect of the trials. Sometimes there are sufficient trees in the buffer to allow destructive sampling and other times the study owner has to decide which aspect is more important: more G&Y data or new wood quality data, a tough decision on an investment started as long as 60 years ago. Sampling for wood quality involves expensive careful studies. We need to select stems that grew in the precise environment we want to evaluate, carefully harvest and dissect the stems into logs or cookies, then truck all this material to the lab for analysis, sawing, drying, finishing, and stress testing. The ultimate goal is to provide forest planners, harvesters, and mill managers with information to decide the optimal regime for selecting, harvesting, and processing plantation wood for their mill(s). As well, the results can be fed back to land managers so they can establish new plantations at the best initial spacing. The above is no easy task, so there is great collaboration between many agencies. Land owners/managers such as provincial Departments of Natural Resources and the Canadian Wood Fibre Centre have provided sampling sites. Universities and FPInnovations have provided lab space and time on some rather expensive analytical machines. ForValueNet, a NSERC-funded research network, has provided funding for professors and students to supplement the brain power from previously mentioned organizations. This is all coming together in a quest to provide integrated models supporting value-added wood decision making for the new forests. Other species are subject to similar efforts. Add thinning to the mix and the data requirements and models get more complicated, but there is an increase in applicability for industry. Alberta’s new Forest Products Roadmap, a strategy developed by the province’s forest industry and the Alberta government to help shape the sector’s future, has been described as a unique accomplishment and an immediate call to action. Focused on enhancing the contributions and competitiveness of Alberta’s forest products sector, the Roadmap was started in early 2011 against the backdrop of one of the most challenging periods in in the industry’s long history. Hit hard by the collapse of the U.S. lumber market and global economic slow-down, the forest sector knew it needed to build on its strengths and find opportunities for transformation. The Roadmap process was led by senior management of companies representing the full range of forest products manufacturing in the province, and Alberta Environment and Sustainable Resource Development (ESRD). Steering Committee co-chairs Fred Dzida of Weyerhaeuser, Mike Voisin of Alberta-Pacific Forest Industries and Bruce Mayer of ESRD, together with outside expertise, set about compiling extensive information on the industry. Their research included markets, manufacturing processes, advances in traditional products, and opportunities for innovative new products. As the same time, the group was working to develop a structure for the Roadmap. An executive group was established, comprising the Minister of ESRD, six forest industry chief executive officers and the Dean of Business at the University of Alberta. A steering group composed of additional experts from industry, ESRD and Alberta Innovates Bio Solutions was put in place to put the Roadmap strategy and goals into action. And, task groups were formed to focus on priorities in the areas of innovation, markets, energy, labor, ecosystems services, transportation, access to fibre, and partnerships. “This unprecedented collaboration was an opportunity to stand back and take a more strategic look at the forest sector in the province, create a vision for ourselves in collaboration with the Province of Alberta, and then chart a path forward,” says Weyerhaeuser’s Fred Dzida. Ron Reis of Alberta forest company, Millar Western, leading the Innovation Task Group, emphasized the Roadmap’s timeliness. Under the Roadmap, industry and government want to strengthen existing core business areas—lumber, panelboard, pulp, paper, secondary manufacturing—while moving toward emerging business opportunities, such as investigating the production of bio-energy, bio-fuels, and bio-chemicals from cellulose. Alberta Innovates Bio Solutions (AI Bio), with its mandate to help expand the Alberta economy through support for growing the bio-economy, was among the participants that helped draft the Forest Products Roadmap, and it continues to have a strong voice on the steering committee and task groups. “There are many opportunities for the forest sector to become engaged in the development of new products, such as green electricity, bio-diesel, methanol, ethanol, wood pellets, biochar, nanocrystalline cellulose and other high value products, such as pharmaceuticals,” says Steve Price, Executive Director for Advancing the Bio-economy at Alberta Innovates Bio Solutions. Being part of the Roadmap process has provided AI Bio with a strong indication of industry’s priorities to help tailor its own programs, and has made forest companies better aware of the innovation activities and organizations that exist in Alberta. Many have discovered that they can partner with organizations like AI Bio or the Biorefining Conversions Network (BCN) to start taking advantage of bio opportunities or to fill gaps in programs already underway. “We are now seeing companies that operate in Alberta looking toward energy self-sufficiency, looking at using residual biomass to move into the development of electricity to meet their own internal requirements and also to meet the societal needs of Alberta in future,” Price says. Bio-energy is certainly a priority with many Alberta forest companies, because they have high energy demand and access to feedstock, such as process wastes and residuals, that can fuel renewable energy generation. Given the strong buy-in seen among all players, it seems clear the Roadmap will help ensure Alberta’s forest sector stays ready to seize new opportunities as it moves into a strong future. 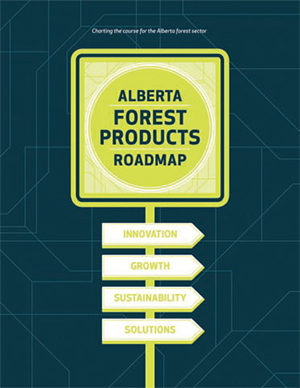 For more information about the Alberta Forest Products Roadmap, contact Steve Price at steve.price@albertainnovates.ca or (780) 427-2567.